2- step method for losing belly fat faster than ever. With holiday parties and gatherings quickly approaching, most of us are now thinking about looking our best while dressed in our finest. Too bad that losing body fat is a slow and steady process, rather than an instantaneous fix. However…I do have an extremely effective 2-step method for losing belly fat faster than ever, and I’d like to share it with you today so that you can utilize it to look and feel your best this holiday season. Look Your Best for the Holidays. This deadly, fat-incinerating method fights fat simultaneously on two separate fronts for maximum effectiveness: your sugar intake and your high intensity workouts. First: This step requires zero extra effort on your part! In fact all you have to do is NOT do something that you’re currently doing! You stop consuming refined sugar, in all its forms. This means no sodas, no desserts, no packaged snacks, no candy, no mocha lattes, NO SUGAR AT ALL! When you stop to evaluate your diet, it may be shocking to find out how much refined sugar has crept in. Nothing will contribute to fat gains as swiftly as consuming sugar, so it makes sense that cutting sugar out is the top must-do for shedding those unwanted pounds. It’s not necessary, or beneficial, to starve yourself during this time of rapid fat loss – you should fill in your diet with lean meats, vegetables, nuts and seeds as you cut out the refined sugar. Keep your metabolism high by fueling up on high protein, high fiber, low carb, and zero sugar foods whenever hunger strikes. Second: Here’s the step that requires some effort, but trust me when I say it’s worth it. You crank up the intensity of your workouts to a whole new level. Most people take exercise on with the slow and steady mentality – moving, pushing and pulling as little as possible while still “getting the job done”. I’ve got some news for you…if you still have belly fat to lose then the job wasn’t getting done. If you can comfortably hold a conversation, hardly break a sweat, or feel the same when it’s over as you did when it began, then you’re simply not pushing yourself hard enough while you exercise. Increasing the intensity of your workouts requires focused intent. You must go into the session with the goal of pushing your body to the limit. Remember, it’s a contained timeframe that will be over shortly, so bear down and deal with the discomfort. With practice you will learn to embrace the burn. The safest and most effective way to crank up the intensity and effectiveness of your exercise time is to work with a qualified fitness professional, such as myself. I would love to hear from you! Call or email me today and together we will get you started on your fastest fat loss ever now before the holiday season brings on more unwanted pounds. Want even more fat loss? Studies continue to prove that diets high in protein encourage more fat loss than diets high in carbohydrates. Each of your snacks and meals should be built around a centerpiece of high quality, lean protein. ​I love recipes like this, where the flavor and enjoyment outshine the health benefit. 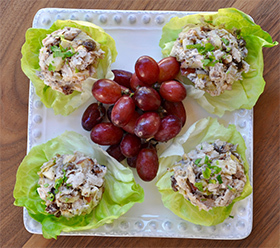 One bite of these Chicken Lettuce Boats and you’ll see what I mean – the crunch, the collision of flavors and the creamy enjoyment will push all thoughts of calories and fat grams out of your mind…but rest assure that this recipe is highly healthy and will keep you on track towards your fat loss goal. Enjoy! In a large bowl combine the chopped apples and orange juice. Mix to combine. Add the remaining ingredients (save for the lettuce and grapes) and mix well. Chill, covered, for 15 minutes or until ready to serve. Use an ice cream scoop to place the chicken salad on each lettuce leaf. Garnish the plate with red grapes and Enjoy! Previous: Previous post: Meal prep made easy.